Leica Sport Optics is proud to reveal their latest revolutionary innovation in laser rangefinding technologies. The Leica Geovid HD-B was the world's first commercially available laser rangefinder when introduced over 25 years ago, and all of the subsequent Geovid laser rangefinding binocular models have been staples for the serious hunter ever since. Now Leica has set the bar once again, with the New game-changing Leica Geovid HD-B. This latest geovid model features class-leading ranging capabilities and field of view, fully functioning ballistics capabilities utilizing the patented Advanced Ballistic Compensation (ABC) technologies features in Leica's popular CRF 1600-B, and the unique ability to program customized bullet & caliber ballistic data for the most precise holdover readings possible. The Leica Geovid HD-B also features vastly improved optical performance utilizing Leicas exciting new Perger Porro prism system. The new Geovid HD-B transmits more light and offers an amazingly, wide field of view. This means these are more effective than ever for scanning the horizon for hidden game. The rangefinding abilities are improved as well, and the new Geovid HD-B can effectively range out to 3000 yards - the longest ranging capabilities in class. Available in both an 8x42 and the popular 10x42 size, the new Leica Geovid HD-B features a clever, curved, ergonomic chassis that rests perfectly in the palms of the hands for superior grip, comfort & stability. The new Leica Geovid HD-B offers the widest field of view of any rangefinding binocular, ranges further than other rangefinding binoculars, and is the only model to offer full ballistics holdover calculations and angular ballistics computations. As with Leica's past popular Geovid models the new HD-B of course delivers lightning fast line of sight distance readings using the most sophisticated micro-processing available. However, by adding Leica's patented ABC system you now have an amazingly versatile tool that allows you to choose between three different point-of-impact corrections. For shooters utilizing standard plex or similar reticles the ABC system can offer line of sight distance with holdover corrections in inches or centimeters. Shooters with standard turret adjustments can get additional point of impact corrections in "clicks" in either 1/4 MOA or mil-radian. And finally shooters may choose to receive a calculated Equivalent Horizontal Range (EHR) for those utilizing custom turrets manufactured specifically for their rifle & cartridge combination. In all cases the ABC system accounts for air temperature, absolute air pressure, and angle of incline when making the calculations. Where holdover is being provided the sophisticated processing system also considers the specific ballistic characteristics of your cartridge & rifle combination. The Leica Geovid HD-B and the ABC system provide one of the most comprehensive selections of pre-programmed ballistic curves in the industry. With 12 availalbe options to choose from, every shooter is bound to find a curve that closely matches the ballistic performance of their cartridge. Additionally, the Geovid HD-B features another amazing and wholly revolutionary function that allows shooters to take this even a step further. Using the LEica online ballistic calculator and use of a micro SD card clot conveniently located in the waterproof battery compartment, each user can upload their exact ballistics information into the Geovid HD-B. After entering their ballistic data onto the card, all one has to do is simply insert the loaded micro-SD card (included with each Geovid HD-B) into the card slot and the Geovid does the rest. With the micro SD card inserted the Geovid HD-B's intelligent features automatically use the ballistic information on the card by default, with no additional programming or feature selections necessary. For shooters with multiple weapons you can carry different cards for each weapon being used and simply insert the card that matches the specific hunter's rifle & cartridge combination. This customized approach allows for greater accuracy to further distances, due to the precise nature of the ballistics data. LCA40800 Leica Geovid HD-B 3000 8X 42 (Rangefinder Binocular) With Ballistic Interface New for 2018! LCA40801 Leica Geovid HD-B 3000 10X 42 (Rangefinder Binocular) With Ballistic Interface New for 2018! 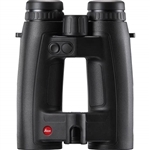 LCA40802 Leica Geovid HD-B 3000 8X 56 (Rangefinder Binocular) With Ballistic Interface New for 2018!